Well August went fast. I was off work for the first 11 days of the month. In those wonderful days I spent my time doing a morning run nearly every day, some much needed garden work, lots of reading in the afternoons and of course, spinning and knitting. As I will be spending most the fall traveling around the province living out of a suitcase, I had no desire to leave my home. My conviction to be a “picker” and knit continental style continues. It’s going well. When I pick up my knitting, my hands automatically go into the picking mode, and for some stretches of plain knitting, I can knit without looking. Not sure if I am faster than I was before, but I am no longer slower. In fact I think I am about the same. I’ve been merrily pounding out those lovely baby socks from Kate Atherley’s free Ravelry pattern – I wrote about these in my last monthly reflection, that seemed to be only yesterday. I’m onto pair number 6. While I was off work I also did some much needed tidying up. 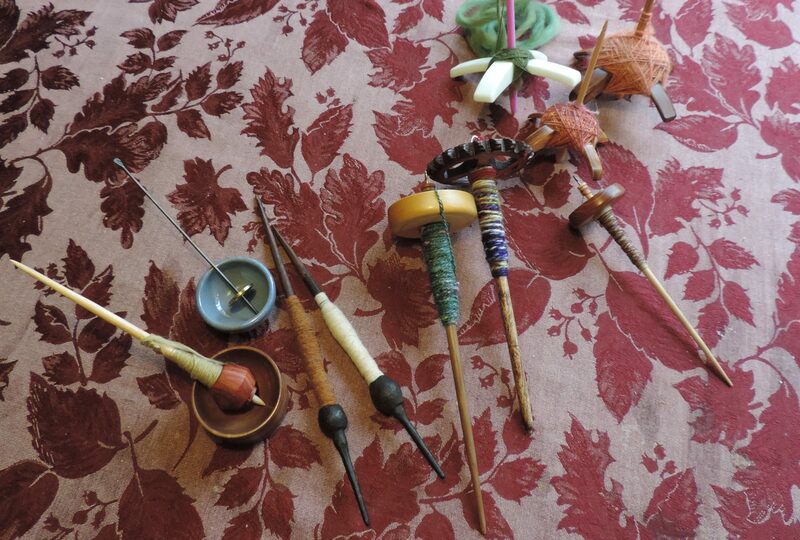 After each of my spinning workshops I have a lot of little bits of fibre from the demonstrations and such. I gathered them all up, put them into colour groups and using the blue/green pile, carded up a couple of batts along with some angelina. I spun that up and that’s what you see in the bobbin on the left. 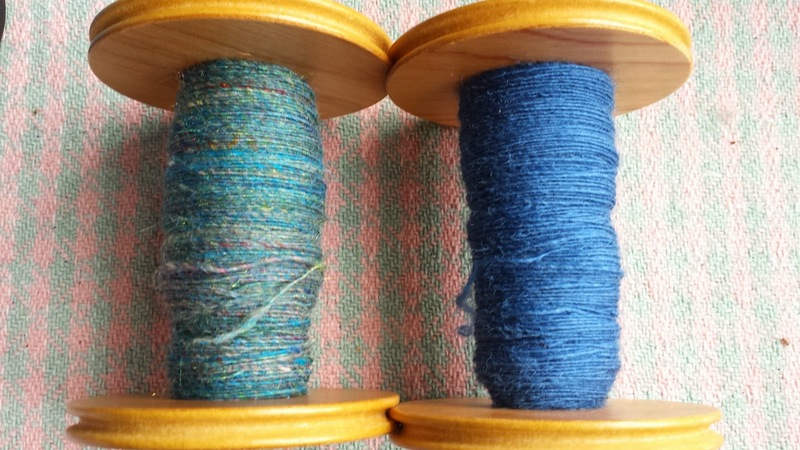 The bobbin on the right is local romney, dyed with indigo and carded on my drum carder. It was a left over from the Aldergrove Fair days sheep-to-shawl demo in 2013. Each one wasn’t really enough to do much more than making a pair of baby socks. . . and while there’s nothing wrong with that, I wanted more yarn. So I plied them together. The result is below – 105y/96m of worsted weight yarn. Just enough to make a nice pair of half mitts. 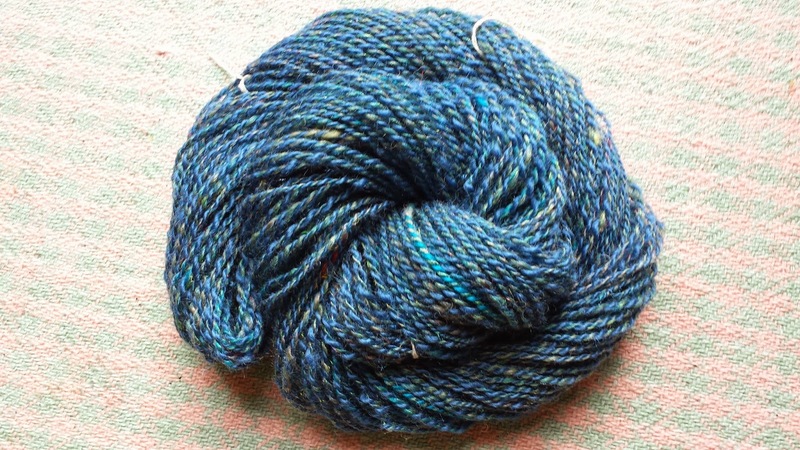 The yarn has depth from all the colours, sheen from the romney and surprise sparkle from the angelina. All this from left overs. The really important thing I did was I cleaned and tidied my studio. It had really gotten out of control so I took a strong hand to it and rid myself of stuff I won’t be using, and putting all the other things away. A place for everything and everything in its place. And if it doesn’t have a place, that’s a good moment to pause and think – do I want this? Do I have a place for it? The unfortunate part of the studio tidy-up was that I did it on my very last day of holidays. Right after I cleaned, purged and reorganized, I went back to work the next day. And then was busy the next two full weekends. The result, I have a tidy studio. But I am also having some difficulty remembering where I put some things. Oh sure, it’s a great idea to come up with new organization schemes, but it’s also a good idea to live them for a few days to make sure it goes into long-term memory. For example, I spend a week looking for my wee box of DPNs only to find them in a most logical spot – in the very box where I keep all my other knitting needles. The upside of that week of searching is that I am intimately familiar with every, and I mean every nook and cranny of this household. And found several things I had thought long lost. And on the very last day of the month, I visited a woman who very generously gave me the freshly shorn fleeces of her two lovely llamas – milk chocolate and dark chocolate. First glance looks promising. I am going to ask my friend M from the guild who raises llamas to go over the fleeces with me so I can learn more about llama. And finally, I have news about my cotton plants, but this blog post is already too long, so stay tuned. This entry was posted in spinning on September 1, 2014 by DianaTwiss.